Protecting tables and counters from Instant Pot liners, crock pots, slow cookers, hot plates, pots, pans, and trays requires a quality holder that will not warp or bend under extreme temperatures. Look no further than this extendable stainless steel trivet. Its compact design is good for storage and versatile enough to accommodate different cooking vessels of varying sizes. The solid construction of it keeps the trivet from moving or being impacted by the weight and temperature of the item it is holding up. Use it to rest a tray or two of cookies straight from the oven. With more than one expandable trivet, large baking or cooking projects can be tackled and put on any flat surface without fear of ruining it. Larger baked items such as loafs of bread can benefit from a trivet hot plate like this one when utilized as a cooling rack. It is also handy when buffet style meals are involved. The trivet elevates the food to keep tables safe while keeping the vessel at a good height for guests. Let family members serve themselves soups and stews at daily meals without having to get up. Plates of fresh rolls or muffins can sit on the trivet too for a convenient dining experience. Crock pots and other large food containers are able to take advantage of the expandable trivet. This is beneficial for kitchens where large items have to be moved out of the way to complete other tasks. The stainless steel material holds up well under strain and can withstand wear associated with frequent use. Want to have a home skillet meal? This pan holder fulfills the requirement and its extension capabilities provide a setting for two smaller pans. When all the meals and cooking are done, this trivet can serve as a small drying rack for cups, lids, and flatware.It can even be used for tasks outside of the kitchen. Small crafts that require being set aside to dry have a spot on this holder and away from foot traffic. Instant Pot liners, crock pots, hot pots and pans, and other stove top containers can damage tables or counters. 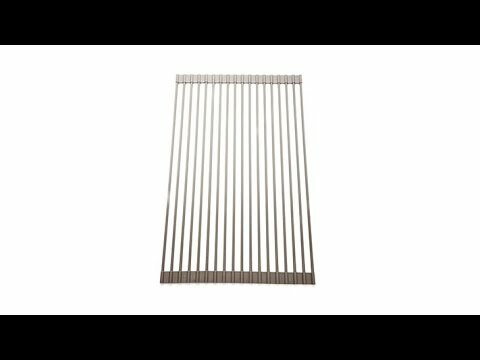 This stainless steel trivet can prevent that it from happening. But a pot holder is usually too small in size or created with material that won’t survive against extreme heat. These issues are solved with this flexible kitchen item. The extendable metal trivet is the go-to rack for hot pot. The steel trivets are made of tough steel that will stand up to daily use. Trivet steel is easy to clean and it will hold up a good amount of weight. Use it as a kitchen pan holder to spare surfaces while cooking multiple dishes. Adjust the sizing to fit hot foods, platters, and pots. Stainless steel trivets make good cooling racks for baked goods too. Foods, sauces and liquids will come off of this steel easily. Simply wash it with soap and water and wipe it dry to use again immediately. Let family members serve themselves soups and stews at daily meals without having to get up. Plates of fresh rolls or muffins can sit on the trivet too for a convenient dining experience. Crock pots and other large food containers are able to take advantage of the extendible trivet. This is beneficial for kitchens where large items have to be moved out of the way to complete other tasks. The stainless steel material holds up well under strain and can withstand wear associated with frequent use. Trivets stainless steel make an ideal cooking vessel without a pan or pot. Meats and fish could be roasted on it. While barbecuing, a steel trivet elevates foods and provides extra stability to prevent pieces from falling underneath the grill plate. Kebabs and larger vegetables like corn and potatoes sit securely and keep surfaces from burning due to direct heat. Getting creative with cooking is better with a metal trivet around for fits of culinary inspiration. Get creative and use one around the house. Place coasters, napkins, or condiments on a trivet for family dinner or a party buffet. Display collectables and delicate items on the expandable surface for a tidy look during events or get together. Art that requires finishing by fire can be put on a trivet. Set pieces of jewelry on its smooth steel when firing is necessary. Ceramics with a flat bottom benefit from a durable steel trivet in the high heat of a kiln.